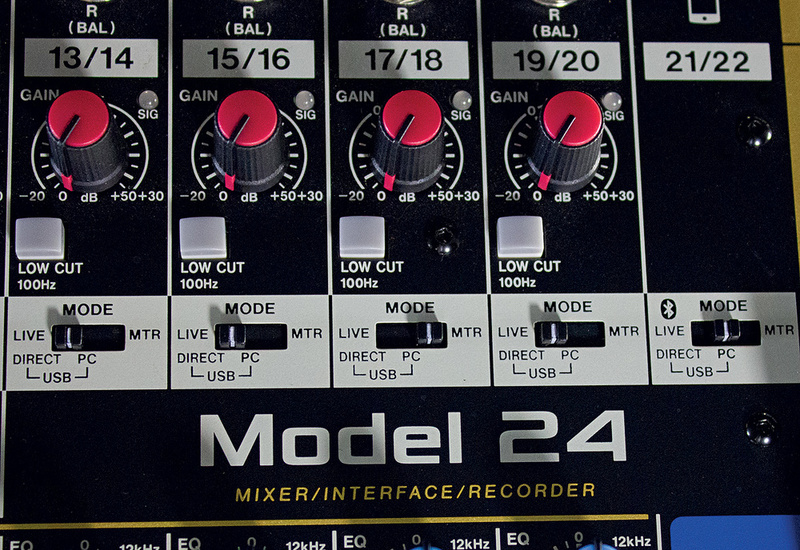 With its striking colour scheme, long-throw faders, faux-wood metal end-cheeks, and spacious layout, the Model 24 evokes memories of a time in which every function had a dedicated control and confusing nested digital menus were a rarity. Now, I don't plan on ditching my DAW software any time soon — but I was certainly keen to discover how much of that old, simpler approach to recording Tascam's Model 24 could bring back to my studio. I was also interested to find out how it might meet the needs of location recordists or those capturing live recordings of gigging bands. 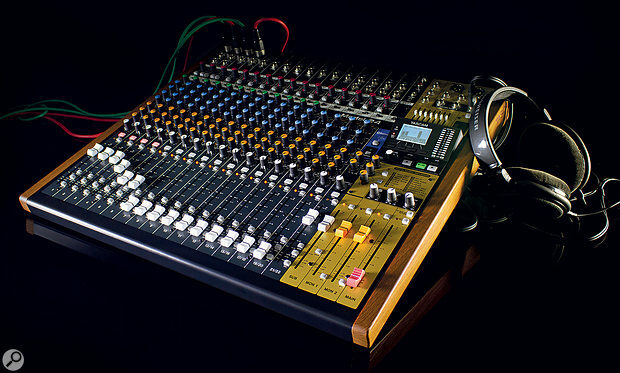 Unlike some other all-in-one products, the Model 24 is arguably best thought of first and foremost as an analogue mixer — but one with a multitrack recorder built in, and one that doubles up as a 16-mic preamp, 22-input USB 2.0 audio interface. The integrated multitrack digital recorder is the headline feature, and by today's standards it is fairly basic — though I believe that's deliberate. You can record, playback, punch in (with a pre-roll if you wish), choose your song sample rate/word length and edit song names. And that's pretty much it. There are no editing tools and there's no virtual takes facility, or anything like that. Crucially, though, the individual track-arming means you have the option of recording a full 22-track project all at once or building it up only one or two parts at a time. That's something you can't do when partnering another mixer with one of the latest generation of stand‑alone multitrack recorders from, for example, Cymatic Audio or Allen & Heath, since these devices record to all tracks simultaneously (or, at best, in two passes, each writing to half the tracks). For individual track-arming in such a setup, you'd need either a computer or a more upmarket device such as a JoeCo Black Box Recorder. In fact, the only current product I'm aware of that offers this facility and a similar number of channels for around the same price is the Zoom LiveTrak L‑20. That, though, is a rather different product that I'll discuss towards the end of this review. 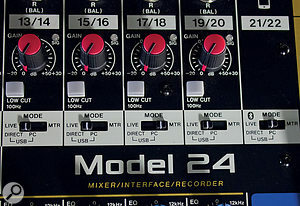 What the Model 24 isn't is a direct replacement for the do-everything stand‑alone digital Portastudio that Tascam and others have being making and refining for the last couple of decades. Some may lament that fact, but I think it's a very sensible design decision. To have turned this into a full bells-and-whistles digital studio would have added considerably to the unit's complexity, putting off as many people as it pleased. It would also have bumped up the asking price significantly! As it is, the Model 24 offers you enough built-in recording facilities that you can be liberated from the computer when recording or songwriting. And when you've captured the parts, you have the option of using the multitracker to play back your recordings and create a basic analogue mix, or hooking up to your computer via USB for more demanding file management, editing and mixing tasks. Let's face it, even free DAW software offers way more power than any stand‑alone digital recorder can. 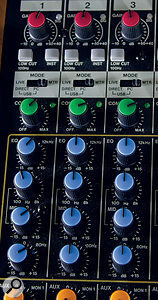 The first two channels offer high-impedance instrument inputs and insert points, while both of these and the following 10 channels also boast a one-knob analogue compressor, as well as the analogue three-band swept-mid EQ.The best way to get your head around the Model 24 is first to consider how it operates as a mixer. It's billed as having 22 analogue inputs (the other two of the 24 recordable tracks being the main stereo mix's L and R channels), but these are arranged over 17 channel strips, each of which has an input source selector (for the analogue inputs, and for the USB and multitracker playback). The first two strips are mono mic/line/instrument channels with a balanced XLR mic input, a switchable TRS jack balanced line/instrument input, and a TRS jack insert send/return point. As with all connections other than the USB socket and IEC power inlet for the built-in PSU (both on the rear), these are mounted on the top panel. The next 10 channels are the same, except that they lack the high-impedance instrument input option and the insert point. 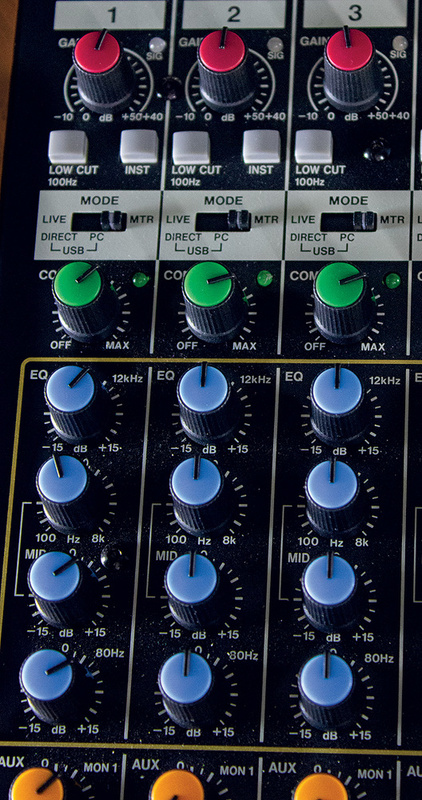 Each of the first 12 channels also boasts a one-knob analogue compressor and a three-band (high/low shelf and swept-mid) EQ — there's up to ±15dB of gain per band for all of the channel EQs. The compressor and EQ can be set to have no effect, but they're always in the signal path. Note that the A-D/D-A converter lies between the compressor and EQ in the signal path so any compression is 'printed to tape', but the EQ isn't. Three aux send controls follow, the first two being pre-fader (for cue mixes), and the last a post-fader send for the digital effects engine and, in parallel, the balanced mono-jack FX output. Post the aux sends, the signal reaches the mute switch, the channel fader and the pan pot. Adjacent to the fader are buttons to route the signal to one or more of three busses — Main (the stereo mix bus), Sub (a stereo group bus) and PFL (which sends the pre-fader signal to a solo bus). TEAC UK +44 (0)1923 797 205.